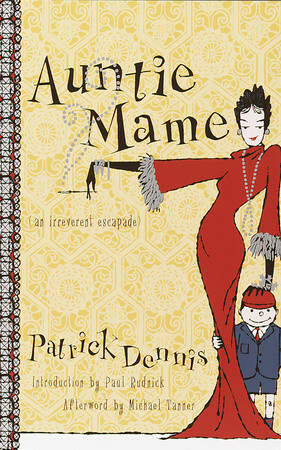 I'm not sure when or where I came across this novel but, since I had seen the movie once and liked it and this book had a fabulous cover, I decided to pick up Auntie Mame by Patrick Dennis. It was published in 1955 and was on the New York Times bestseller list for over two years (112 weeks!). Though steeped in the superficial--clothes, homes, engagements--the story takes some surprisingly deep turns and I thought it was a fun read even though Mame was extremely exasperating at times. 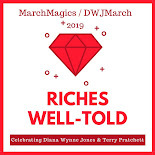 The narrator is also named Patrick Dennis, writing as an adult who is looking back over his exceptional life with his Auntie Mame. After he is orphaned at the age of ten, he moves from Chicago to New York City to live with his father's sister. From the moment he steps out of the elevator at her floor, he is swept up into a world of high society, low inhibitions and many ups and downs. Mame is a free-thinker who falls head-over-heels for the young man that comes into her life. She always wants what's best for Patrick but maybe doesn't know exactly how to get it. Whether it's enrolling him in a nudist elementary school or pretending to be someone she is not to please his future in-laws, Mame always means well but her outrageous personality often gets in the way. The story takes Patrick from the age of ten until he has a seven year old son of his own. The main difference between the book and the movie is Mame. In the novel, she truly loves Dennis but in a very matter-of-fact way. She speaks to him as she would to an adult and she expects him to catch up. She's not always kind but what she does almost always turns out to be in his best interests. 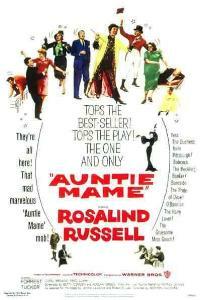 In the film, Mame is much more emotional and sentimental. I would have loved to see Rosalind Russell be a bit less weepy and a bit more saucy. Also, the novel is quite a bit racier -- be it with Mame's marriage to a younger Southern gentleman (who was already engaged at the time he met her), her involvement with a young lecherous Irish poet or her ill-advised relationship with one of Dennis' college friends. Some of these situations aren't even mentioned in the film and the others have the teeth taken from them. The man she marries in the film actually appears to be older than she is, which makes the relationship not very interesting at all. The novel also takes on the racism and sexism of the early- to mid-twentieth century in a very honest way. There is an exchange between Mame and Dennis' future father-in-law regarding Jewish people (at the start of WWII but pre-American-involvement) that is presented in about two lines of the film but takes pages of the book. Mame is absolutely amazing in this scene and it's one of the moments where her intelligence and depth are revealed. The film takes away many of those moments and makes them mushy with a bit of slapstick and a smile. Verdict: Both are fun but I would recommend the book over the movie. It's got more substance and is a forgotten gem. And I would definitely recommend watching the film first because, if you watch it second like I did, you are bound to see its shortcomings. Support our site and buy Auntie Mame: An Irreverent Escapade (the book) and Auntie Mame (the film) on Amazon or find them at your local library. We bought our own copy of the book. Recommend the book over the movie, you mean? I like Rosalind Russell (in everything so far!) but I would be totally intrigued to read the book if it's better. I always forget there was a book, and only remember the existence of musical and movie. Jenny - Good catch! Yes, I meant book over movie and I've just changed it. I like Rosalind Russell too. She totally didn't do a bad job with the script. I just think they wussed it up for the film. I read the book and saw the movie at about the same time (which was also when I was in rehearsals for the musical--I get obsessive like that). I can't remember which I liked better, but I did enjoy both. I understand that the film of the musical (with Lucille Ball) is dreadful, but the musical as written is quite a lot of fun. Not a lot of teeth in it though. Teresa - I haven't seen the Lucille Ball version but I also read that it's quite bad so I think I will skip it. Cozy - Thanks for stopping by!